and one last pic . 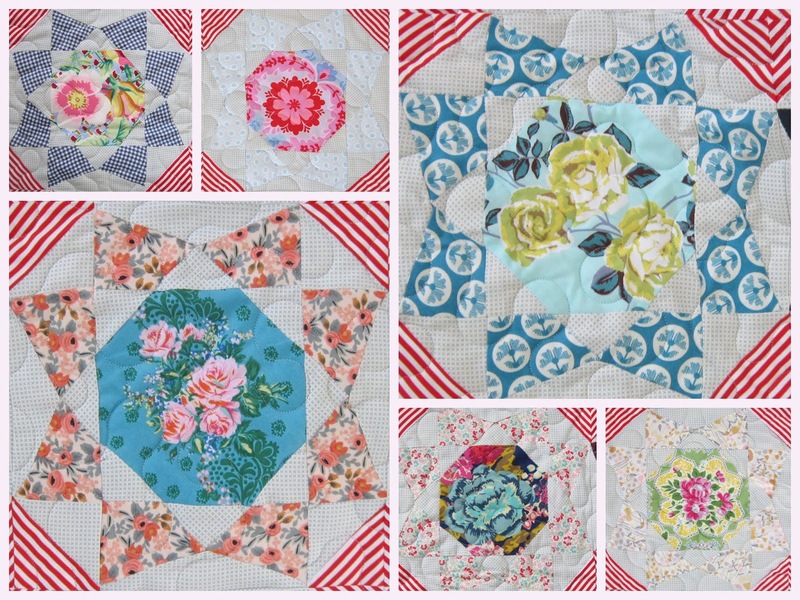 . .
'Candied Flowers' is my version of "Whimsy" an eye spy pattern from Judy Newman's book, 'quilts made for life made with love' - see here for details. I started making this quilt in June 2017, slowly piecing a few blocks at a time. I decided it was an ideal way to showcase my large florals. Each centre flowery octagon was framed with a blending itty bitty print and set on the same neutral background throughout. There were a couple of cheeky inset seams which proved challenging at the beginning, but the hardest decision for me was choosing the stripe. Love the secondary circular pattern that appears when viewed from a distance. I recently had it machine quilted in a simple loose meander pattern by Leeanne from quiltmekiwi. Many chose to hand piece this quilt but I went with machine piecing. The finished quilt top ended up quite stretchy, not sure if this is because I didn't hand piece it or not. Anyways, Leeanne told me she used starch on the top before machine quilting and it worked well. I used a stripey vintage sheet I found at a thriftshop for the backing and my binding was a lovely Art Gallery fabric, Indiefolk in rouge. My finished quilt measures 129cm x 174 cm (approx. 51" x 68").
. . . oh well, there's always next year. - a new place where fellow bloggers can meet and share what they've been making. Lovely to see this quilt finished and ready to enjoy. I enjoy seeing all the different fabrics you have used and really like the way the stripe worked out. Nice to end the year on a high note! Oh this is beautiful - love seeing it in all the different photo settings. I agree with the machine quilting - pulls it together without demanding attention. WELL DONE! Super quilt! Love the idea of using a thrifted sheet for backing. I'm often reading about quilters doing just that, never seen a suitable sheet in a Charity Shop, perhaps I need to be more dedicated in my search! Wonderful quilt. I think you should move to North Carolina so I can take a class from you!! Congratulations, your 'Candied Flowers' quilt is gorgeous. I think the soft loose quilting is perfect. The binding is beautiful too. I like Art Gallery fabric, I think I'll have a look at their Indiefolk in rouge. Such a happy summery quilt Linda, I think it's a real beauty - congratulations! Such a lovely, lovely quilt! That red and white fabric just makes the quilt come alive for me. Love it!! I have enjoyed watching you create this lovely quilt. Thanks for sharing so many photos along with your process. The red and white stripe really sets all those beautiful florals. I'd say this was the perfect last quilt of the year! What a way to end 2018! It's gorgeous and the scrappy-ness is captivating! Wow! What a wonderful way to finish the year. That is gorgeous! Now I'm off to find the pattern! Thanks so much for sharing. Hi Linda. What a lovely quilt! Those red strips look great, even if they were a brave choice. I love Judy Newman's designs too, although they are softer than I usually chose. I hope she comes to Symposium in Auckland. I'd be very tempted to take class with her. Thank you for linking up to my Peacock Party, and for mentioning it in your blog post. Gorgeous! Congrats on a beautiful finish. You picked the perfect setting to highlight the florals. It's gorgeous! Those stripey corners are just the best! Wonderful! Those little bits of red stripe pull it all together with a fresh feel. Spectacular Finish, Linda!!! I love it so much that I can look at this all day long. The red/white striped corner triangles make such lovely focal points, almost like they are moving. Love how you combined the soft florals with the geometric design element so smoothly. The red binding makes it so festive, perfect finish for the holidays. This quilt just makes me smile. It truly is beautiful. A most fabulous finish!